Kayak, Run, Walk around Mill Pond/Robert's Cove. Kayak to Nauset! 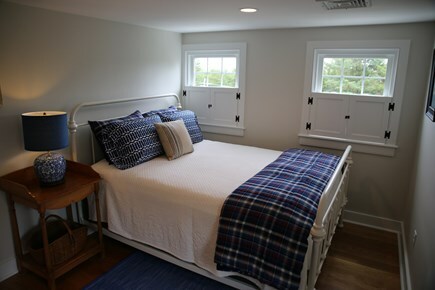 The first floor guest bedroom #3 has a queen sized white metal bed, large closet, and light oak hardwood flooring. A small den/T.V./reading room is off of the kitchen and can be shut off from the rest of the house with a sliding glass barn door. It features a white built-in banquette for seating. 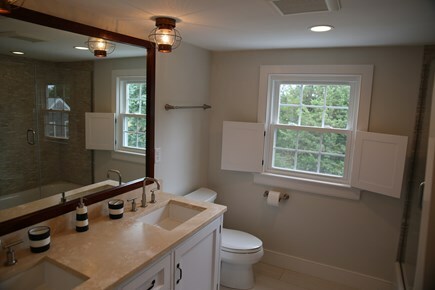 The first floor also has a full bathroom #1 with white tiled shower and white granite/mahogany sink. Second floor has three bedrooms. 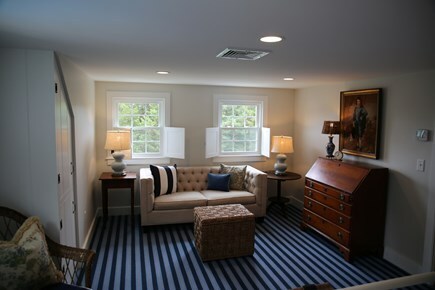 The master bedroom #1 has a queen sized white metal bed, separate sitting area with built-ins for ample storage, a T.V., and navy blue stripe wool carpet. 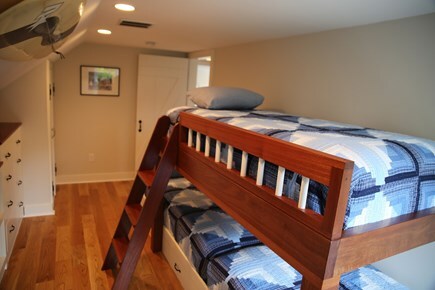 Guest bedroom #2 has a queen sized white metal bed, guest bedroom #4 has 3 built-in twin charming mahogany bunk beds. Second floor has light oak hardwood flooring. Second floor full bath #2 has two white sinks with beige honed marble counter top and beige honed marble shower tiles. Fresh linens and bath, hand, and face towels are provided. The main house has white barn doors and white shutters throughout for privacy. 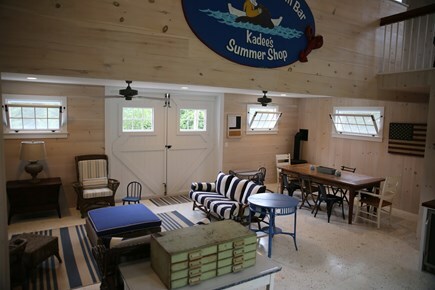 The large boathouse/poolhouse built in 2015 features an open concept first floor and a second floor loft. The first floor consists of: a family room/T.V. area; kitchen/bar area and dining table seating for 10; along with #3 full bathroom. 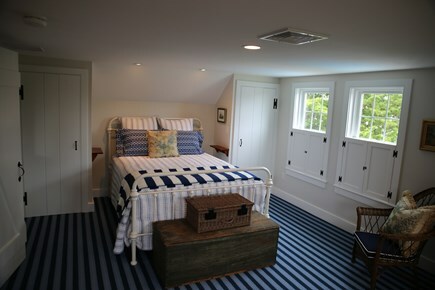 The boathouse has a FUN white painted pine flooring with white washed pine paneled walls throughout to give it a cozy yet spacious and bright nautical feel. The full bathroom #3 has a white tile with navy tile border shower stall with white sink and mahogany counter top and cabinet. The kitchen/bar area has high gloss mahogany counter tops with under cabinet beverage refrigerator and full dishwasher with stainless sink. It also includes another table that seats 10, along with a gas Vermont stove. The second floor loft has an amazing game room equipped with a ping pong table, air hockey table, and a foosball table with ceiling fans. There are 2 sets of barn doors, one set includes french doors that open up onto the bluestone patio, yard, and pool. Truly spectacular for a party or family get together! The full basement is finished with a separate sitting area and T.V. 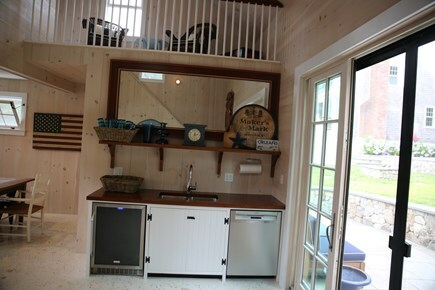 There is a laundry/mudroom that has the washer and dryer, iron and ironing board with storage, and a slop sink. The laundry/mudroom door opens to one of the outside showers, yard, and pool. It has central air. 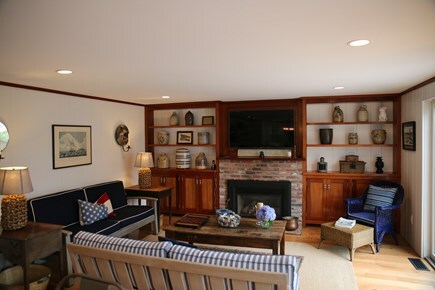 The main house comes with a brand new 2013 central air conditioning system with 2 zones. Smoke detectors and carbon monoxide detectors are on every floor. In addition, the house has a 2013 hot water heater, high speed internet, 4 HD TV's with 3 DVD players, telephone, oil heating main house, propane heat in the boat house, underground sprinkler, gas grill on the deck, beach chairs, beach towels, and beach toys. Very close proximity to East Orleans Village provides a country market complete with a butcher/fish counter, wine/beer, bakery/cafe, and deli; a famous ice cream parlor, shopping, pizza store, outstanding restaurants, and the Academy of Performing Arts. Orleans offers a variety of kid-friendly and fine dining restaurants, antiques/vintage shops, public tennis courts, ball fields and playgrounds, public library, markets, bakeries, ice cream parlors and mini-golf. Enjoy the historic Fourth of July parade in town or the fireworks at Rock Harbor. Orleans is also home to two of the finest beaches on the Cape - Nauset Beach on the Atlantic Ocean and Skaket Beach on Cape Cod Bay. 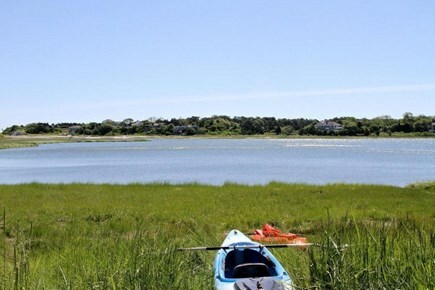 Enjoy these beaches, tidal marshes,or the many fresh water lakes and ponds for their swimming, boating, kayaking, fishing, walks/runs, shell/rock collecting, sunrises/sunsets. In addition, the Nauset Middle School in town is home to the Orleans Firebirds, an all-star college baseball team that plays in the famous and historic Cape Cod Baseball league. Orleans truly has it all. If that isn't enough, you can go deep sea fishing out of Rock Harbor or whale watching from Provincetown or Barnstable Harbor. Take a ride along historic 6A to explore the quaint New England towns, sample the local seafood at some of the amazing restaurants, or visit the many antique shops. Take the high speed ferry to Martha's Vineyard or Nantucket Island for the day. Historic Boston and Fenway Park are 90 miles away. Amazing week on Cape Cod. Loved our new rental house. The kids (5) from 20 thru 15 years old loved the location, the layout, pool, grounds, area, and the pool house. Tons of fun was had by all and most of our stay was at the house or on Nauset Beach. Early morning walks to the boat launch and evening strolls around the quite neighborhood. Loved cooking in the gourmet kitchen, but I'm no gourmet chef....many breakfasts and bbq dinners were prepared and enjoyed. Thank you for an absolute beautiful time! Your home has so much love in it! The decor is so comforting, and you have left no stone unturned. We were able to unpack our personal belongings and get right to the fun! The house and property are meticulously maintained and make it very easy for guests to be together as a family for meals or a movie night. Our children enjoyed swimming in the pool as much as we did! Thank you for having some games available for us as well. We will be sure to visit again. 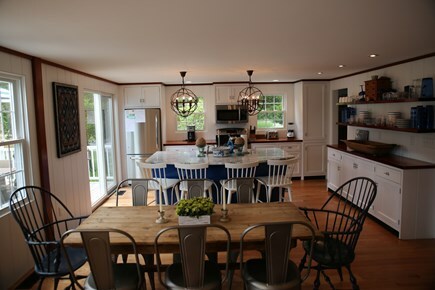 If you're planning a dream vacation with family or friends on Cape Cod and searching for the ideal house that in reality lives up to the beautiful photos of the property on the vacation website, then this gorgeous house in Orleans is it. 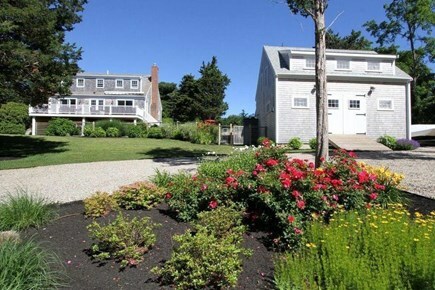 My husband and I rented this house for one week after our wedding in Falmouth. I'm originally from Melrose, a town 15 minutes north of Boston, but my husband is from Switzerland and that's where we live now. Trying to plan a wedding from overseas and find a vacation spot for the week after is not easy, but Liz was incredibly helpful, and accommodating, and overall great, along with her husband who was also there upon our arrival with warm congratulations on our nuptials, and to answer any questions we may have had about the property. As a kid, my family and I had vacations on Cape Cod and that's why we chose to have the wedding there. However, my husband's family and friends had never been to Cape Cod and some were even visiting the U.S. for the first time. Of course I wanted my Swiss in-laws and my husband's Swiss friends to be happy with our rental, but they were all completely blown away by how beautiful this house was. They loved this place so much that some days they just wanted to chill poolside and enjoy the tranquility of the area. Actually to be fair I don't even think the pictures do the property justice because it's even more spacious and charming in person. Hi everyone. I have been vacationing on the Cape for over 50 years and my husband and sons have for over 30 years. We love the Cape, especially East Orleans! We have been renting for the past 6 years. This is our second rental home, new 2018! Our number one goal is to provide all our families with a truly wonderful, spectacular ''Cape'' experience so they return season after season to the CAPE!! We love our families, most have rented from us numerous times. We have met some wonderful families from as close as the east coast to as far as London, England. Before we owned, we rented for many years! And what a hassle to lug all the linens, towels, beach chairs! Our biggest goal is to make it easy and very welcoming to our families who vacation with us! We have four sons, so we try to think of everything to have on the Cape, to make it easy for mom (and dad too). 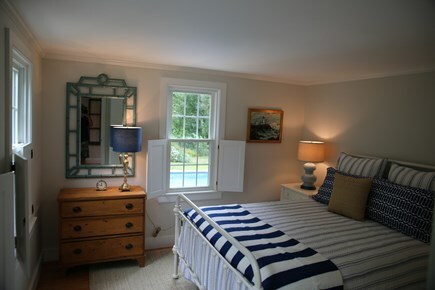 We take a lot of pride in providing a great Cape vacation experience! Thank you for looking at our homes and thank you for staying! All the best!! 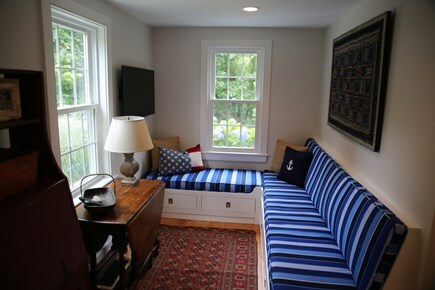 16 SEAVIEW- Meticulously cared-for home, in East Orleans, a ''true/CLASSIC'' Cape w/ a fun nautical theme. Tastefully decorated with Pottery Barn/Restoration Hardware and some special cape antiques, beach decor with all the modern amenities! A truly perfect RETREAT! Recently has undergone a high quality renovation, Main house has 4 bedrooms and 2 full bathrooms w/ a gourmet eat-in kitchen/family room, open concept design, leading to an expansive sunny mahogany elevated deck.The new lg. 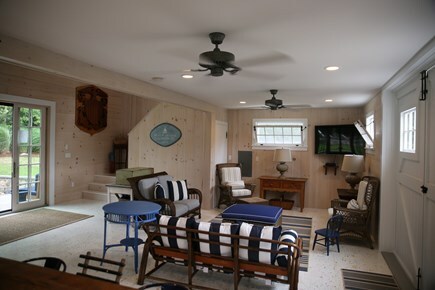 boathouse/pool house has a full game room, family room, kitchen/bar, and full bathroom. 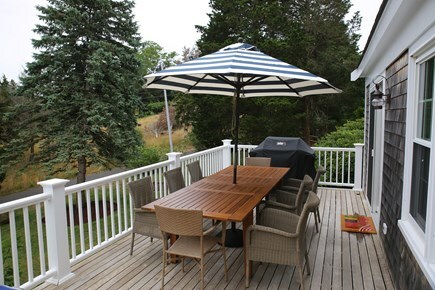 The lovely private fenced-in front and back yard is professionally landscaped with rock walls & flowering perennials. It has a beautiful & professionally maintained salt water heated pool with stone & brick patios for entertaining and BBQ'ing. Yard features a large stone wood fire pit & two outside showers. 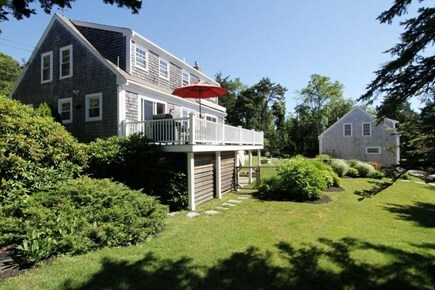 On a private lane w/i walking distance to Mill Pond & Robert's Cove! 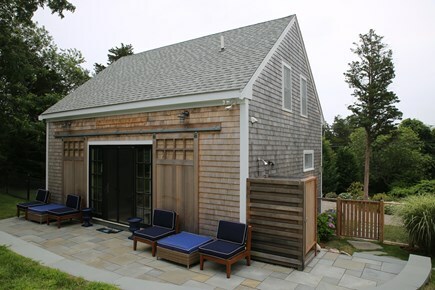 Providing great access to those sandy beaches & estuaries, w/views of Nauset Beach & beyond. Great for kayaking, shellfishing, walking, biking, hiking, and stand up paddle! 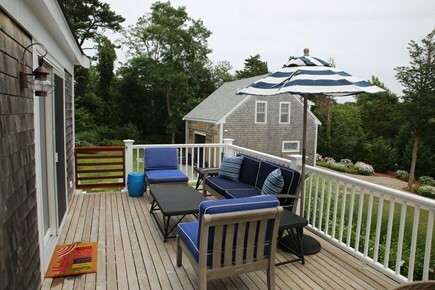 21 DALE ANN- Great vacation home in a wonderful neighborhood on a cul-de sac, very close to Nauset Beach! Able to ride your bike to the beach! You can smell & hear the ocean from the house!! NEW GREAT mahogany & white PVC deck runs entire length of the house with a 3 season room/enclosed porch. Amazing family spaces.... my kids call it the hidden GEM of ORLEANS! We love Orleans! It's the GEM of the Cape. East Orleans is a year round town. It is home to the greatest ocean beach on the Cape, Nauset Beach, which is only a little over 2 miles away. If you want the Cape Cod Bay beaches, Skaket Beach and Rock Harbor are only 4 short miles across town. It's a great spot for kids to catch hermit crabs, walk the flats, and watch the sunset. We have many family friendly restaurants and gourmet restaurants as well. Easy access to the bike path, shopping, mini golfing, antiquing, fishing, kayaking, paddle boarding, and golfing. And don't forget about ice cream on the Cape, a tradition in New England! Just down the road we have one of the best on Cape, Sundae School. And I save the best for last, Cape Cod Baseball a tradition on the Cape! Come see the famous Orleans Firebirds play from the end of June thru August at Eldredge Park in Orleans. A terrific fun-filled time had by all!! Come to the CAPE - You won't be disappointed. #SUMMER!